Lattice Tree Studio is so honored to have been part of this beautiful Blush and Sage Equestrian inspired styled shoot alongside some very talented local vendors. This shoot was put together to showcase the local talent that belongs to the Tuesdays Together Group of the Rising Tide Society in Columbia, MD. 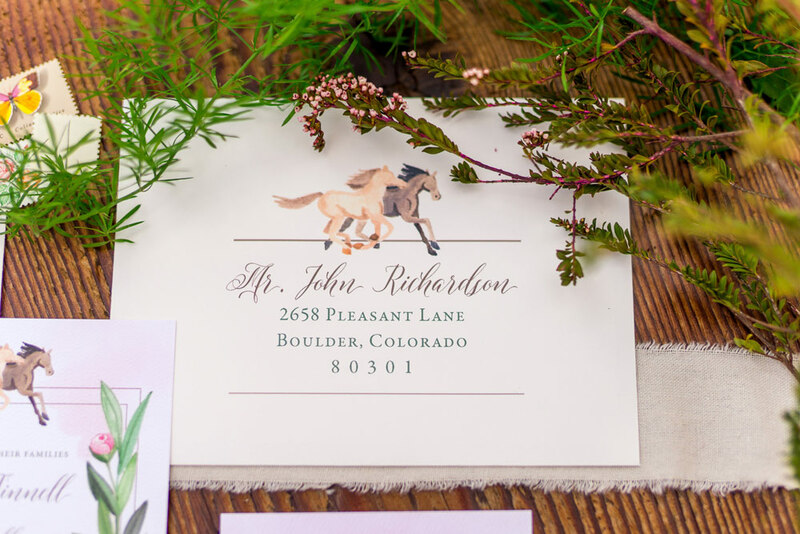 For the invitation suite, we hand painted pink florals and paired them with blush watercolor swashes, and a miniature illustration of horses. The shield shape was used throughout the invitation suite to bring in the idea of a crest. The details card was cut to match this shape. This shoot was also featured on the Rising Tide Society Blog.